One of the premier subdivisions here at Edmond is the Olde Edmond. This neighborhood is located between Danforth and Covell on Coaltrane. This deluxe community was built in the 1990′s and early 2000′s. It is relatively close to Kickingbird Golf Course and Fairfax Golf course, and just minutes from downto wn Edmond, UCO (University of Central Oklahoma) an inexpensive, and thus highly sought after university in the state, Oklahoma Christian University and the OSBI Crime Lab and a host of other businesses in Edmond. 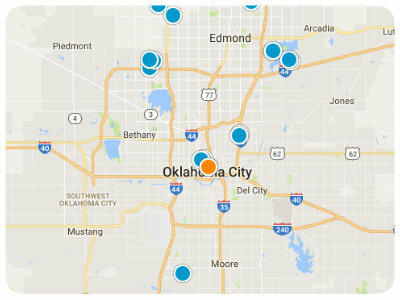 In addition to that, there is easy access to I-35 and all points in the Greater Oklahoma City Metro area. Schools that serve this neighborhood are Edmond North High School, located on Danforth just west of the railroad tracks. Sequoyah Middle School, named after Sequoyah, a Cherokee silversmith, blacksmith, and an inspirational educator and author who independently created the Cherokee alphabet and Northern Hills Elementary School named for the geographic location of the school, descriptive of the northern section of Edmond where it is home to the “Husky Pups. The marvelous houses here ate Old Edmond are constructed by the most trusted and reputable builders in the state using only the highest and premium quality of materials and workmanship beyond comparison. Making Olde Edmond one of the prime and sought after gated community here at Edmond. As a resident you get to experience prime and top of the line amenities here are Old Edmond such as clubhouses where you can host numerous family and community activities, large swimming pools both, indoor and outdoor with standby lifeguards around the area, walking and jogging trails, fitness facilities, parks, playgrounds, lake, sports courts, expanses of greenbelts and the list just goes on. What are you waiting for? Visit Olde Edmond and see what it has to offer for you and your family. Edmond is the Beverly Hills area for Oklahoma City. It is an interesting and fun place to live weather you are single looking for your first home, a family seeking for a great place to raise your kids or retirees searching for a quite place to settle down. The city of Edmond offers superb hotels, restaurants, championship golf courses, conveniently located attractions and nostalgic shopping areas featuring the distinct and antique. All with the added pleasure of beautiful public art on almost every corner. Public art is featured in many outstanding life-size bronzes you’ll find on corners around town. The City of Edmond has made a conscious decision in developing the visual arts aspect of this community. The result is that treasures for the eye abound making Edmond a very special place to visit indeed. The Mother Road in Edmond which is just located on scenic Route 66, places you just minutes from international attractions such as the National Cowboy and Western Heritage Museum, Remington Park horse racing, the Lazy E Arena and picturesque, historic Guthrie, just to name a few. 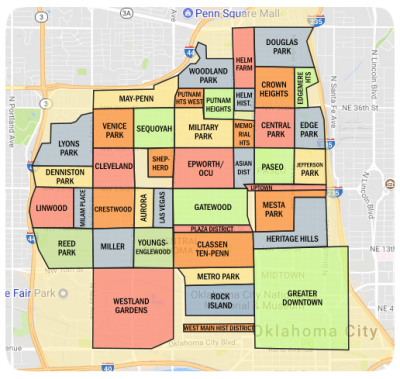 There are also a great number of gated neighborhoods in Edmond which offers safety and privacy as well as away from pollution and traffic noise.